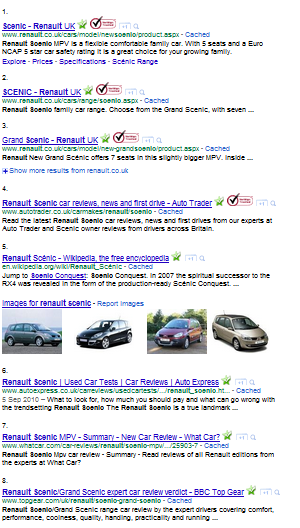 If you’re actually more interested in the car than online marketing techniques, then your best bet might be to visit Renault’s website where you can find out plenty of information about the Renault Scenic. There’s images showing in position 6. I’ve deliberately used a numeric file name for the image here, and placed no caption or alt attributes. In the image of a Renault Scenic below, I have used a variety of signals that the image is relevant to a Renault Scenic. I’ve also used a picture of a car that is obviously a car in order to provide an additional signal to Google based on their image recognition algorithms. So here we go. 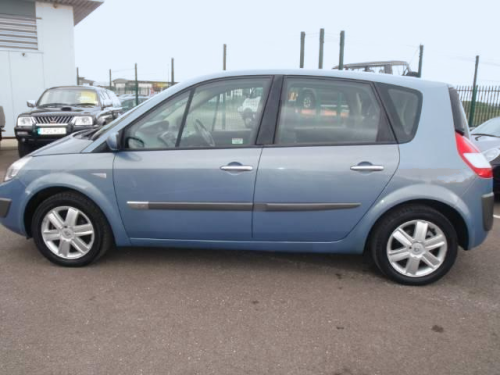 This picture of a Renault Scenic uses renault-scenic as it’s file name, title, description, and also as the h3 element that introduces this section of the page. You’ll also notice that the post heading, URL, and internal links within the blog also use “Renault Scenic” within them. All in all it probably goes too far if I was hoping to rank the page within the standard search results, but my main goal is image search. Specifically for the purposes of getting in the universal search pull through, because I want to get a feel for the traffic volume that this generates. I’ll feed back in a couple of weeks about the results of the test.